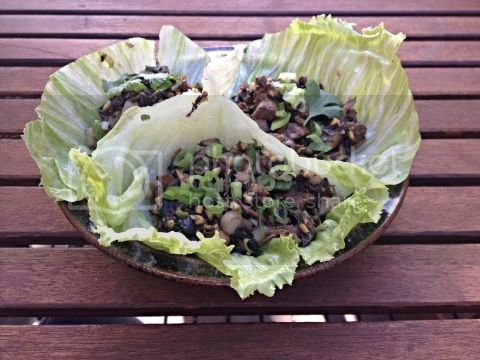 Unlike some families, san choy bau wasn't a dish that was on rotation in our household. I've probably only ever had it once or twice in my life. As it seemed like a nice summery dish and I could eat it with my hands, I thought it was worth a shot. I couldn't quite find a recipe that suited my liking so I modified a few and this is what I came up with. In a wok, heat peanut oil then add mushrooms, garlic, ginger and the white part of the spring onions. Stir-fry for 2-3 minutes until mushrooms are soft. Add water chestnuts, peanuts and sauces and cook for 1 minute until most of the moisture has evaporated. Remove from heat and stir through coriander, green part of spring onions and lime juice. Spoon mixture into lettuce leaves and enjoy with your hands!